Say hello to our big/little friend: the skillet chocolate-chip cookie. You don’t need a mixer to make him (God bless pre-melted butter), and you don’t even need to dirty a cookie sheet in the process. 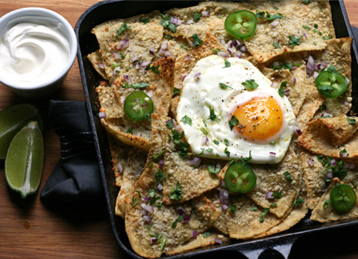 All you need is one oven-safe skillet--and, of course, a tall glass of milk on the side. 2. In a large bowl, whisk the flour with the baking soda and salt. Set aside. 3. In another large bowl, mix the butter with the brown sugar and sugar until well combined (the sugar should look slightly dissolved). Add the eggs one at a time, mixing until well combined before adding the next egg and the vanilla extract. 4. Add the dry ingredients to the wet ingredients and mix until just combined. Fold in the chocolate chips. 5. Press the dough into the prepared skillet and bake until golden brown and baked through, 30 to 40 minutes. Let cool 15 minutes before cutting and serving.